This species is accepted, and its native range is Tropical America, Tropical & S. Africa, Madagascar. Perennial; culms 8–50 cm. long, slender, wiry, ascending, often rooting at the lower nodes. Leaf-blades lanceolate to narrowly-ovate, 1.5–3 cm. long, 2–7 mm. wide, cordate, cross-veins present, glabrous or pilose, usually glaucous, acute, ascending, becoming reflexed at maturity. Panicle ovate, 1–3 cm. long, rarely more, often barely exserted from the uppermost leaf-sheath, moderately branched, the branches spreading to reflexed. Spikelets ovate-oblong, 1–2 mm. long, glabrous; lower glume 1/2–2/3 the length of the spikelet, 3-nerved; upper glume 5-nerved, acute; lower lemma 5-nerved, sterile, its palea well-developed; upper lemma pale, shining. Perennial. Culms prostrate; slender; 8-50 cm long; wiry; rooting from lower nodes. Ligule a ciliate membrane. Leaf-blade base cordate. Leaf-blades ascending, or reflexed (at maturity); lanceolate to ovate; 1.5-3 cm long; 2-7 mm wide; glaucous. Leaf-blade venation with distinct cross veins. Leaf-blade surface glabrous, or pilose. Leaf-blade apex acute. Inflorescence a panicle; exserted, or embraced at base by subtending leaf. Panicle open; ovate; 1-3 cm long. Primary panicle branches spreading, or reflexed. Spikelets solitary. Fertile spikelets pedicelled. Spikelets comprising 1 basal sterile florets; 1 fertile florets; without rhachilla extension. 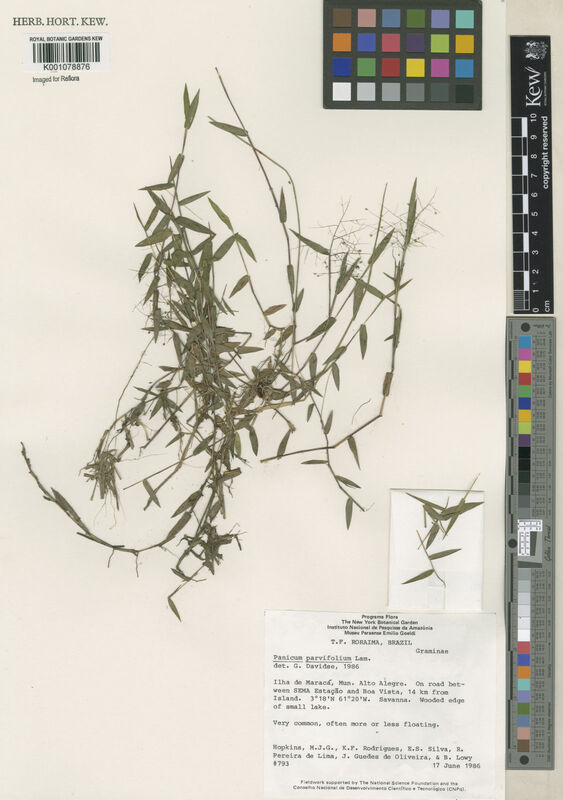 Spikelets oblong, or ovate; dorsally compressed; 1-2 mm long; falling entire. Glumes similar; reaching apex of florets; thinner than fertile lemma. Lower glume ovate; 0.5-0.66 length of spikelet; membranous; without keels; 3 -veined. Lower glume apex acuminate. Upper glume ovate; 1 length of spikelet; membranous; without keels; 5 -veined. Upper glume apex acute. Basal sterile florets barren; with palea. Lemma of lower sterile floret similar to upper glume; ovate; 1 length of spikelet; membranous; 5 -veined; acute. Fertile lemma oblong; dorsally compressed; 1.5-2 mm long; indurate; pallid; shiny; without keel. Lemma margins involute. Lemma apex obtuse. Palea involute; indurate. Africa: west tropical, west-central tropical, northeast tropical, east tropical, southern tropical, south, and western Indian ocean. North America: Mexico. South America: Mesoamericana, Caribbean, northern South America, western South America, Brazil, and southern South America. Perennial; culms 8–1500 cm. long, slender, wiry, branching, decumbent, ascending or scrambling. Leaf laminae 1.5–3 cm. long and 2–7 mm. wide, narrowly ovate to lanceolate, cordate, flat, glaucous, cross-veins present, acute; spreading to reflexed at maturity. Panicle 1–3 cm. long, ovate, moderately branched, the branches spreading or reflexed at maturity. Spikelets 1–2 mm. long, ovate-oblong, glabrous; inferior glume 1/2–2/3 the length of the spikelets, 3-nerved; superior glume 5-nerved; inferior lemma 5-nerved, sterile; superior lemma and palea pallid, glossy. Nativa en Colombia; Alt. 0 - 2000 m.; Amazonia, Andes, Guayana y Serranía de La Macarena, Orinoquia. F. W. Andr., The Flowering Plants of the Sudan 3: 507 (1956). Robyns, Fl. Agrost. Congo Belge 2: 217 (1934). Stapf in Flora of Tropical Africa 9: 726 (1920). Lam., Tab. Encycl. Méth. Bot. 1: 173 (1791).